dōTERRA is a company founded on a wellness philosophy of natural, healthy lifestyle choices and informed proactive participation in one’s own health-care alternatives. dōTERRA CPTG Certified Pure Therapeutic Grade® essential oils and other wellness products are specifically formulated to support a wellness philosophy of eating right, exercising, resting and managing stress, and reducing toxic load. 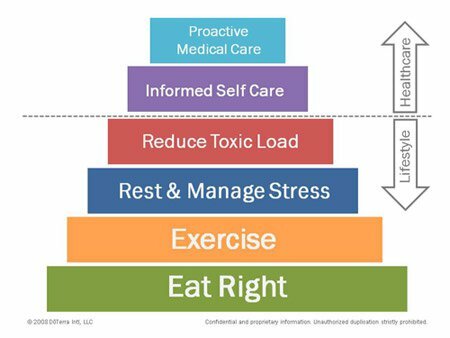 dōTERRA teaches informed self-care and encourages people to take a proactive role in their health and wellness. Our mission as a company is to teach people to live more healthy, productive lives and to share with others the blessing of a lifetime of wellness. This is a lifestyle change. Eating right is a matter of quality and quantity. Our diets should be rich in foods with an abundance of antioxidants, vitamins, minerals, and enzymes. A healthy diet also includes low-fat sources of protein, moderate amounts of complex carbohydrates, and limited fats. Eating right means choosing fresh, whole, unprocessed foods and avoiding foods that are over-processed and contain high levels of simple sugars and saturated fats. The dōTERRA philosophy of eating right also includes the daily consumption of dietary supplements to ensure optimal levels of key nutrients that are essential for longevity and wellness. Regular, moderate exercise is essential for optimal physical and emotional wellness. Coupled with eating right, regular exercise can help one maintain healthy body weight and composition. Healthy activity begins with taking the stairs, walking to lunch, and generally having a “mentality of movement.” A more complete exercise program includes aerobic activity, flexibility exercise, and strength training. Even with our best efforts to practice good wellness habits, daily, we are exposed to toxic environmental stressors that can have harmful effects on our health. Common toxic stressors include overexposure to the ingredients in products throughout our homes, including foods, cleaners, carpets and chemical pollutants in our air and water. Being aware of these toxic threats to our health and choosing products that provide protection and peace of mind from such toxins are also important to optimal wellness. When a person is suffering from acute sickness or has been diagnosed with an illness, it is important they seek out competent and qualified medical professionals for immediate help. It is also important they take a proactive role in their personal course of treatment by learning as much as they can about their health challenge and choosing a physician who will both inform and be open to information.